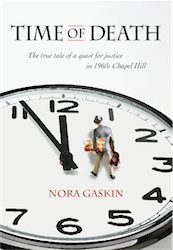 Nora Gaskin - Time of Death The true tale of a quest for justice. Imagine: On Christmas Eve 1963, you go shopping with a friend. You buy a maternity dress for your pregnant wife and a teddy bear for the baby. You return home five hours later and discover your wife and unborn child are dead. Despite medical evidence that she died at the time people saw you out shopping, despite the testimony of those people, despite the letter that proves she was alive when you left home that morning... you are arrested and charged with murder. Nora Gaskin's Time of Death asks the questions, how could an innocent man be put through this ordeal? And what did the town and the era have to do with the miscarriage of justice? The questions are just as current five decades later. This true story became the seed-thought of Nora's novel, Until Proven: A Mystery In 2 Parts.